General Discussion / Forum still active? Custom Mounting / Forum no longer Active? This forum was essentially disabled by preventing new membership. The problem is that Russian spammers spam this forum and try to post advertisements. They use some automated means and create hundreds of fake accounts every day. We put all sorts of road blocks in place that prevented posts, but occasionally a few would get through. It just became too much work to maintain. We have found that it is far more practical and useful for users to post on vehicle specific forums. Anything support related should not be posted on the forum and the support pages, knowledgebase, and support ticket system is the best choice. Ultragauge MX - Manufacturer specific gauges / Re: any MX advantage for 2006 Jaguar Super V8 over EM Plus? UltraGauge Blue Bluetooth OBDII Adapter & Application / Re: Smartphone need to be connected all the time? Inside the white shipping box is another smaller glossy white box roughly 3"x2"x2". The link is printed on this box. 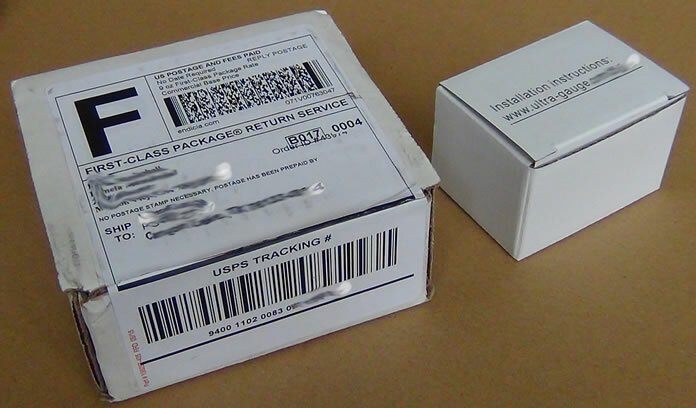 Shown here is the typical shipping box to the left and the UltraGauge Blue product box to the right. I'm not too sure what to select when purchasing for Preprogramming. Since my 2015 Ram Ecodiesel is CAN compliant, should I just choose the generic 'General Motors (GM) with CAN (~2008+) or something different? Inside the shipping box is the product box; a white box which contains UltraGauge Blue. The instructions link is printed on this smaller inner white box. The -40 is what is common in the OBDII standard when dealing with Celsius temperatures. All vehicle parameters are in metric. Hence all temperatures are output with Celsius units. -40C and -40F are the same temperature. UltraGauge Blue Bluetooth OBDII Adapter & Application / Re: So where is the display??? This Category is all about the Ultragauge Blue OBDII Adapter and Application. Please post any non-support related topic here. This will subtract 10 from it.